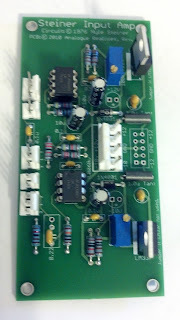 A fairly obvious module, the Input Amplifier is used to bring external signals into the Synthasystem and pull them up to appropriate levels for the modular synth. The module offers a few different input jacks (mine will probably be TS, banana, and RCA), although they are all multed into the same input (so, only apply one signal to the three inputs!). There's a pot to adjust gain, a switch to set gain to high or low, and a switch to enable RIAA equalization. It is a really simple build. The current PCB revision has a couple additions that Nyle and David have made to the input. Originally the input jacks were connected directly to the opamp, but now there's a capacitor to AC couple the input, and a pull-down resistor to hold the input to 0V when no signal is present.